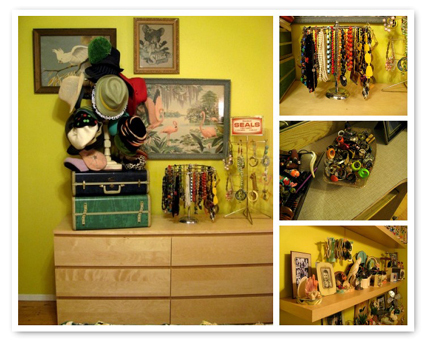 When I had the brain storm for this blog-a-thon about jewelry displays, one of my first ideas was to rally the troops. 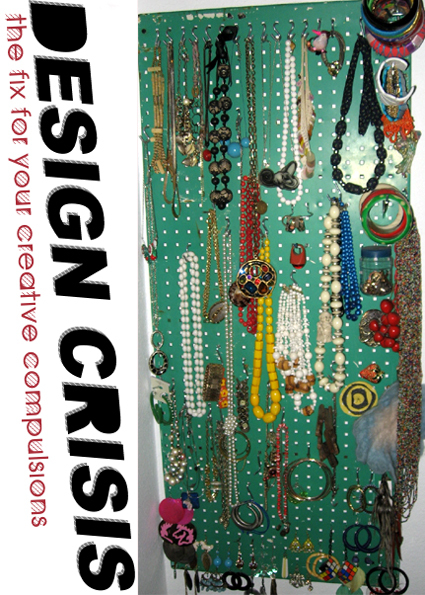 I sent a call out to my crafty contacts, bloggers I heart and friends whose jewelry organization I covet. The end result was a handful of emails with tons of fun pictures to snoop through. 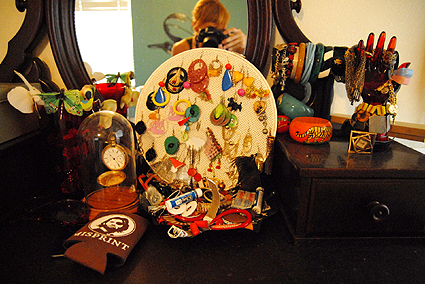 Join me on a voyeuristic journey through the jewelry boxes of some of my favorite people, in alphabetical order. 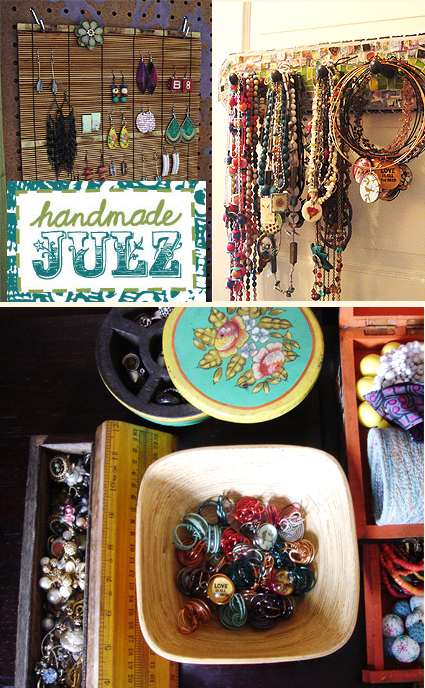 Julie Briggs makes some of the cutest Handmade Julz I have ever seen and has a fun bamboo screen earring holder I am digging. 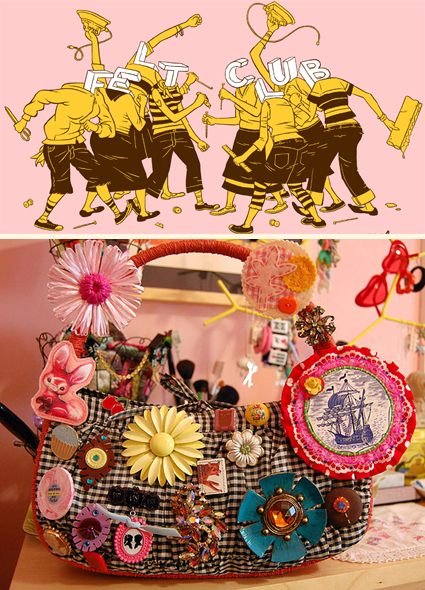 Amy Cluck of Pepto Girl Industries & Pimp Stitch comes in with a double colorful whammy! Lish Dorset one of the crafty mavens behind Handmade Detroit and the Detroit Urban Craft Fair sent us these pics, I spy some Naughty Secretary Club. 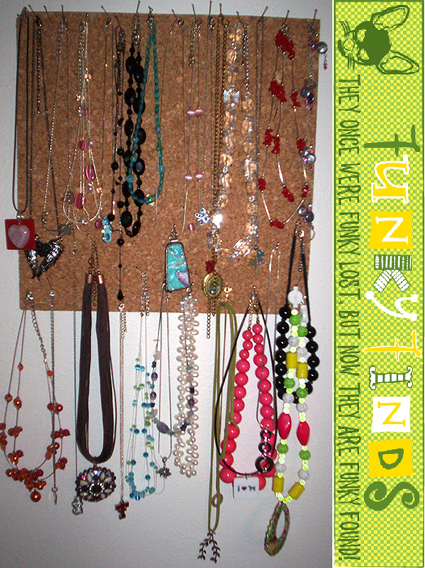 Fellow Texan Jessica Doughterty of Funky Finds has some funky jewelry display ideas. 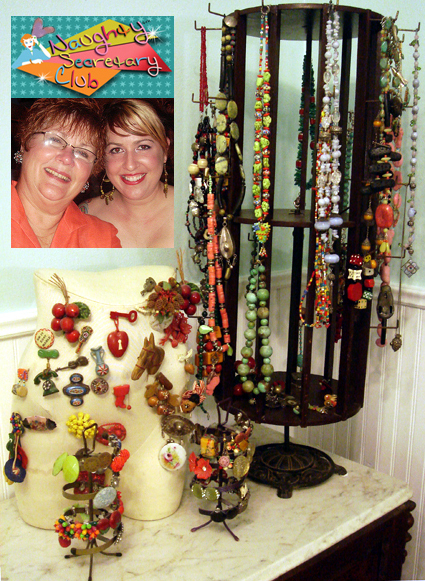 Look closely in the bottom right hand corner to see the yellow, pink, white and green necklace she made in my Revamped Vintage Necklace class at the Make Studio in Dallas. Lady about town in Austin Karly Hand is half of Design Crisis, 1/4 of Stitch, 1/8 of the Austin Craft Mafia and the entire force behind this mean green jewelry display machine. 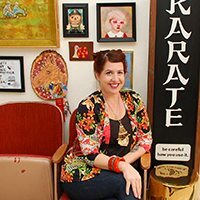 Another Stitch producer and Austin Craft Mafia member making our list is Jesse Kelly-Landes who these days is focusing on cooking, just check out her new blog Bread Baby for proof. She wins the award for most creative use of a scraf. 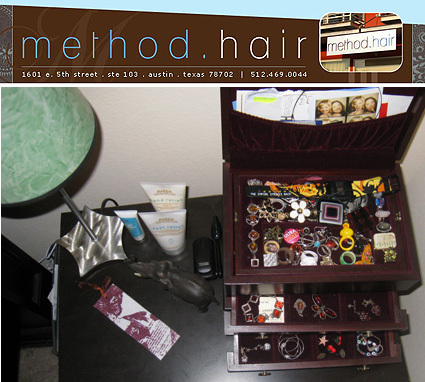 Kathryn Lasater of Method Hair was kind enough to take a minute off from being a new mommy to send us a snap of her bedside jewelry box! 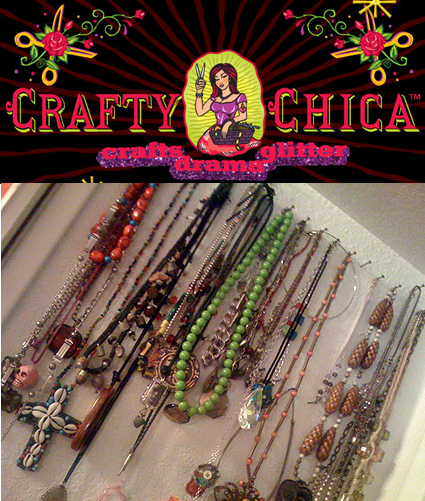 The world famous Crafty Chica Kathy Cano Murillo sent over a quick pic of a few of the necklaces she has hanging on her wall. 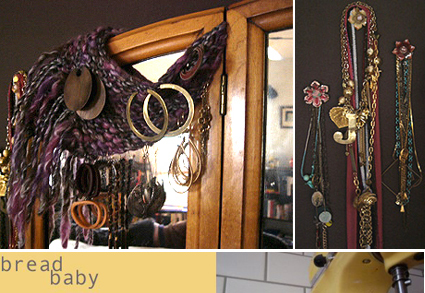 Otherwise known as the craftiest mom this side of the Mason Dixon line Fredda Perkins let me snap some pictures of the antique jewelry display she keeps in her bathroom. I couldn’t leave myself out of the mix. 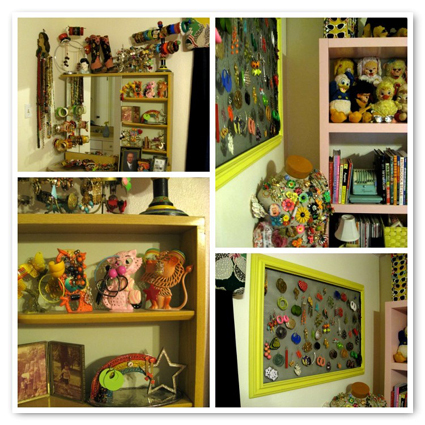 Not only do I make jewelry, I collect it so that entails a whole lot of display action. Photographer extraordinaire (refer to the picture above of me blowing a bubble for an example) Cory Ryan took time out of her busy schedule to send over a couple of some snaps of her jewelry to share! 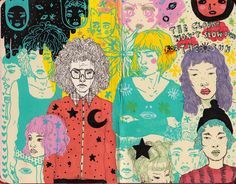 Bonnie Rue is probably one of my very favorite Austin artists. I have several T-shirts from her Model Citizen clothing line and am always in the mood for more. 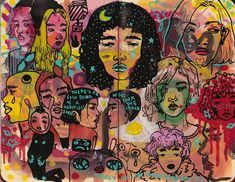 Her earring holder, which was once a mirror before her cat broke it, incorporates in some of her amazing illustrations. 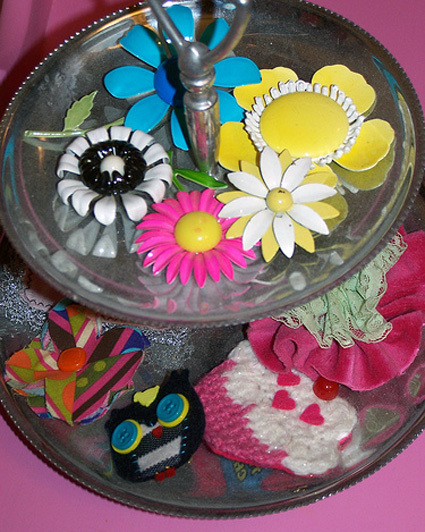 How does Jenny Ryan find the time to organize her brooches so adorably between running Felt Club and blogging for Craft Magazine? Man she is a true Jill of all trades! 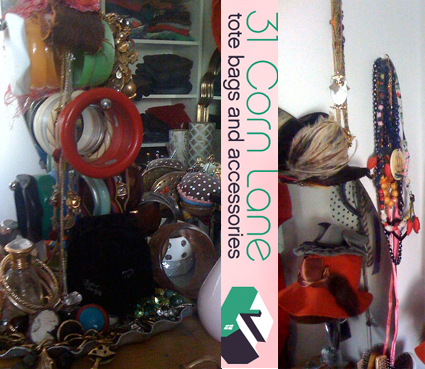 Oh how I love me some Amy Sperber and her fun line 31 Corn Lane. Though I don’t make it to Brooklyn often to see this fantastical lady and her baubles she was kind enough to send me a picture of her stash. 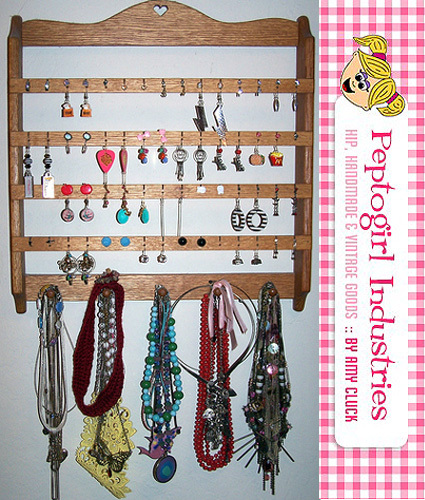 Don’t forget we are dying to see how you have your jewelry organized at home join our How Ya Hanging – Jewelry Displays Flickr Group and show us what you got. 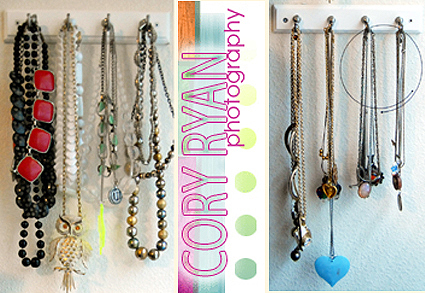 If you are tuning in for the first time this week be sure to check out How Ya Hanging – 4 Days of Jewelry Displays and How Ya Hanging – Make Your Own Jewelry Display. Tune in tomorrow for our final installment of our Flickr Favorites! Posted November 25, 2008 & filed under Jewelry. Wow! 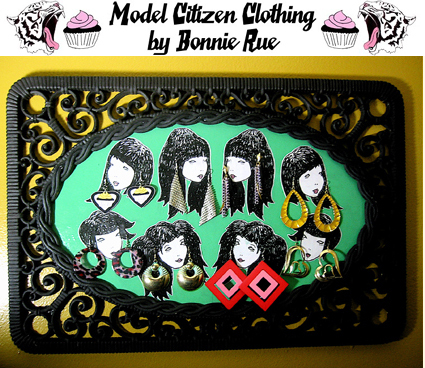 I love bonnie’s painted lady earring holder! 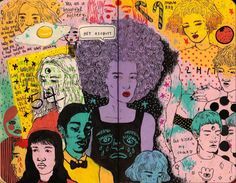 This is an awesome roundup, thanks for including me!!! Thanks for sending over pics Karly! I love Bonnie’s too, she needs to start selling those. I need a whole village of heads for all my earrings. You want heads? I gots lots of heads! 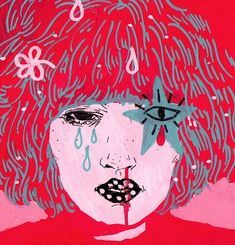 That was a really fun project Jennifer! Thanks for asking me I needed a reason to get out my camera. Everyone’s displays were so cool! Makes me hunger for more jewelry – eek! I love it – completely satisfied my voyeuristic needs for the day! Have to agree about Bonnie’s – so so cute! Ya Kathie I keep hearing that a lot, luckily most of those things are up pretty high on walls and shelves. I’m just hoping for the best on a lot of this I was raised in a house chocked full of antiques and spent my childhood being drug through antique stores hearing don’t touch so hopefully it will work with lil whip too! Either that or I’m gonna have to go minimal. Love that model citizen mirror! Now can she craft me something cute out of the camera and lamp my cat has broken? Wow what a nice jewelries. i like that so much these are so attractive. For the more information visit www(dot)uzbekalive(dot)com. Well this sure does give "Jewelry boxes" a new meaning. 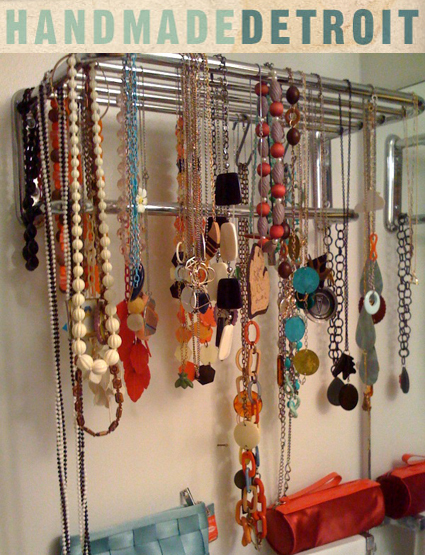 I wish I had as much jewelry as these ladies do I could display my jewelry is a way like this. It looks like artwork!